Elves & Superheroes: Finally, a Balanced Breakfast! No! No! No!! The outfits are all wrong! 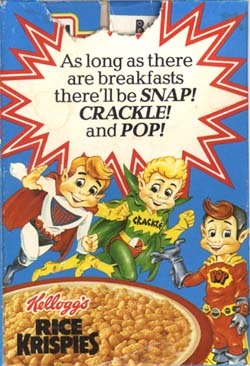 Snap wears a chef hat, Pop wears a marching band uniform, and Crackle...uh, I always forget what Crackle wears, but I know it doesnt include tights and a cape. Well, James, if you were an elf or pixie, wouldnt you have supernatural powers to begin with? Wouldnt the muscles and spandex be overdoing it? Glad to hear the Brits finally got with the program and gave Crackle his stocking cap back.